The staircase inside the "Ghost Ship" warehouse in Oakland that burned on Dec. 2, 2016, seen in 2014. 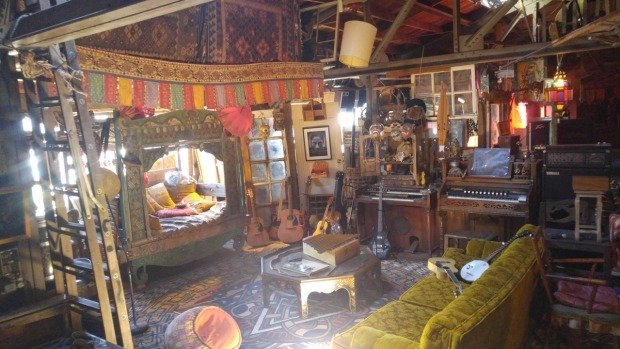 The "Ghost Ship" warehouse in Oakland was a place to "have interesting conversations about embracing different art forms," but the makeshift wooden staircase was dangerous, one guest of the artist's enclave told NBC Bay Area. 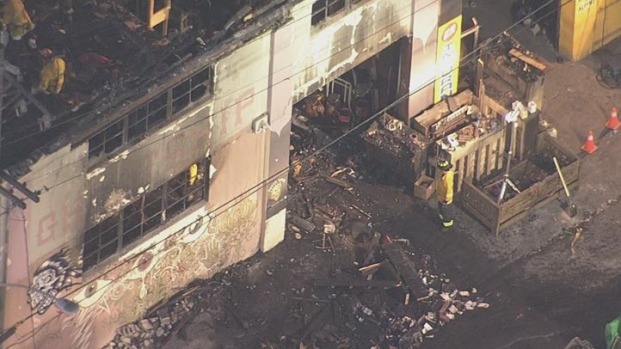 Ajesh Shah, 35, of Oakland, had been inside the space several times, and even helped put on a show there, before it burned on Friday night at an electronic dance party, killing at least 36 people; Oakland recovery teams are searching for more. The staircase may have been to blame for some of the deaths, fire officials noted in a city document released Monday. The inside of the warehouse at 1305 East 31st Ave. was both beautiful and a "disaster waiting to happen," Shah told NBC Bay Area Monday morning. That's why he only hosted one event there, "partly, because I did not feel like I wanted to use the space again because of safety in and outside the venue." The warehouse was an artist's "labyrinth" filled with a bevy of artwork, wooden pieces, electrical wires, Hindu god statues and even a gun. And the stairwell was makeshift, too. Shah took a photo of the staircase, decorated with pink lights, two years ago. "It was a terribly designed staircase," he said. "It was hard to navigate, day or night. It was not constructed well. You could easily miss a step or two and hurt yourself." Other people who had lived or visited the warehouse had also warned of the warehouse's dangerous set-up. And in city documents released Monday, firefighters noted that some of the victims may have been trapped in the blaze when "they couldn't escape down a makeshift, one-way stairwell leading to the second floor made of out wooden pallets." The property owner's daughter, Eva Ng, refuted claims over the weekend that the staircase was made out of wooden pallets. The stairs would have been an exit for the guests, perhaps as many as 100 at the party's peak, to get out of the two-story structure when the blaze flared up about 11:30 p.m. The cause of the fire has not yet been determined. "I think everyone must have told him at some point that this is not a good staircase," Shah said of the artist’s enclave founder, Derick Ion Almena, who did not immediately respond to requests regarding the safety of his living space. Almena first posted a Facebook post after the deadly fire which lamented the loss of his life's artwork. He has since taken that Facebook post down, and in a statement to NBC News, said: "In my previous Facebook post, I had no idea there was a loss of life. This tragic event consumes me every moment. My heart is broken. My heartfelt condolences to the family and friends who have suffered the loss of loved ones." Almena's family, his wife and children, were not at the warehouse when the fire tore through their rented home, he said in the deleted post. The Alameda County District Attorney launched an investigation to decide whether to file criminal charges and who they would be filed against. NBC Bay Area's Michael Bott contributed to this report.